This is a very rich dish and unlike many Scalloped Potato or Gratin recipes it does not contain flour. 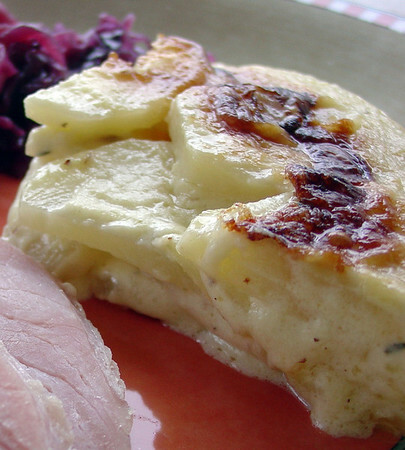 The gratin thickens from the starch in the potatoes which is released by first simmering the potatoes in the cream. I don't usually follow a recipe when making a Potato Gratin. Use the following as a guideline and adjust everything to your own taste. For a rich dish, use butter and whipping cream. Gruyère cheese as well as cheddars and blue cheeses can be added for a different taste all together. Rub cut garlic clove over the surface of a gratin or casserole dish. Butter. Slice potatoes and place in pot and add enough cream/milk to almost cover. Add the garlic clove, thyme, salt and pepper. Bring to a boil and simmer for a few minutes, stirring often so the potatoes do not stick. When the potatoes have released some of their starch and thickend the liquid, remove the garlic clove, add 1 to 2 tablespoons butter (if using) and some grated parmesan cheese. Pour into prepared casserole dish. . TIP: If you like a more garlicky flavour, just grated a garlic clove on a microplane and add to the cream mixture. 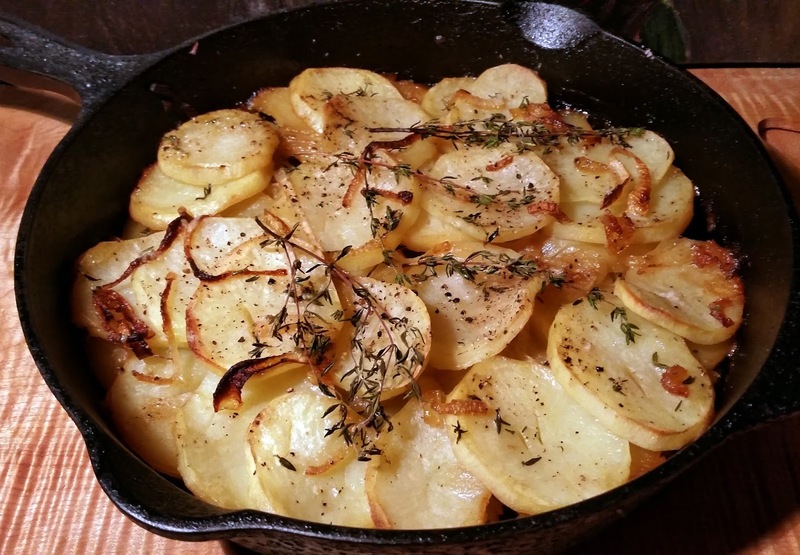 Bake in a 375°F oven for 45 to 55 minutes or until potatoes are tender. Remove from oven and let sit for 10 minutes before serving. Another way to make a potato Gratin is to saute some thinly sliced onions in olive oil or butter until golden, add some thyme, and some chicken broth. Add the potatoes, salt and pepper and bring to a boil. Pour into a buttered casserole dish sprinkle with some Parmesan cheese and bake until cooked. Oh thank you! Man that looks soooo good! Oh my, this sounds good. Good idea to start the potatoes on the stove first. I can just imagine the creamy goodness of this. Thank you so much for sharing this. No comment but yum; wow, this looks good! Wow , that looks yummy !